Even if your corporation is run by a single person/director there are still certain formalities which must be met in order to maintain corporate status and avoid unintentional noncompliance with state law. One such example is the initial and annual meetings. 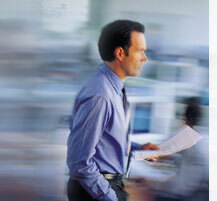 General Corporate Services provides the initial meeting minutes in our complete package. The annual meetings are provided as part of our annual resident agent services. Corporate officers typically consist of the president, vice president, treasurer and secretary. Optionally, there may be additional positions. Many states allow one person to hold all of the offices. The authority and responsibilities of each officer are outlined in the corporate bylaws. Is usually elected by the Board of Directors and is responsible for carrying out the orders issued by the Board of Directors. Although the Board of Directors will most likely dictate actual financial policies, it is the duty of the treasurer to manage corporate bank accounts, and record corporate finances. Is generally responsible for maintaining and keeping corporate records. The Board of Directors is the governing body that directs the fundamental policies and major undertakings of the corporation. The directors usually elect the president and leave general operations and day-to-day business to the president and other officers under their employ. Shareholders (also called stockholders) are the owners of a corporation. As such, the board of directors and the officers of the company owe a fiduciary duty to the shareholders to do what is in their best interest. Specific shareholder rights are outlined in company bylaws and in state law. Though specific duties and reporting practices vary from state to state, the shareholders generally vote on the president, the election of the board of directors and any major changes in the composition or organization of the corporation. Corporate resolutions are not required for every corporate decision. However it would be prudent to record the major decisions of the corporation in the form of written resolutions. This strengthens the corporations legal shield by providing solid evidence that any actions were taken on behalf of the corporation and not on behalf of the owners or officers.